Zdaj pa probaj vse te inštrumente reproducirat iz enih malih dvosistemčkov ! Nič lažjega, samo pravo ime mora pisati na škatlicah, nam samograditeljem se to seveda ne bo nikoli posrečilo, ker nimamo "znanja" za kaj takega. At the Institute of Sound and Vibration Research (ISVR) at the University of Southampton, we have for the last ten years been working on using digital signal processing to improve the quality of sound reproduction systems. The ultimate goal is to be able to produce the illusion in a listener of being in a "virtual" acoustic environment which is entirely different from that of the space in which the listener is actually located. Sound systems designed for this purpose are usually referred to as "surround sound" systems, or "3D-audio systems"; we prefer to label such a system a virtual imaging system. We use the term "stereo dipole" to describe a virtual source imaging system that comprises two closely spaced loudspeakers. 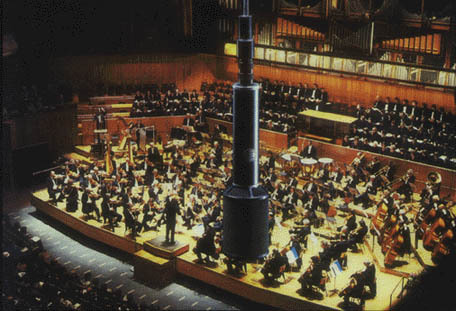 The two loudspeakers ideally span 10 degrees as seen by the listener, and so their centres are no more than 15cm-30cm apart under normal listening conditions. They can therefore both be contained in the same cabinet. The stereo dipole creates a very wide sound stage without introducing any noticeable colouration of the original signal. It generates a much simpler sound field than the conventional 60 degrees loudspeaker span, and it is therefore much more robust with respect to head movement. This page illustrates the profound difference between the two systems by comparing the sound fields generated by the two loudspeaker arrangements. There are two graphics for each loudspeaker arrangement, one for cross-talk cancellation, and one for virtual source imaging (the virtual source is at a position of 45 degrees to the left relative to straight front as seen by the listener). In all four graphics, the two red spheres indicates the loudspeakers, and the circular area in the middle of the yellow square indicates the listener's head which has been modelled as a rigid sphere. The "click" used as input to the virtual source, and as reference signal for cross-talk cancellation, is a short pulse whose main energy is concentrated below 3kHz. When the two loudspeakers span 60 degrees, the working principle of Atal and Schroeder's cross-talk canceller is confirmed. As in the free-field case, the "zone of cross-talk cancellation" is very small. When the loudspeaker span is reduced to 10 degrees, the nature of the reproduced sound field is changed completely. It is no longer possible to pick out any individual positive and negative pulses in the sound field; instead only a single spherical wavefront is seen radiating away from the two closely spaced loudspeakers. The pulse is now beamed towards the listener's left ear, and a "line of cross-talk cancellation" is directed towards the listener's right ear, and this has increased the size of the zone of cross-talk cancellation significantly. The reproduced sound field is very similar to that produced by a dipole source whose null axis is rotated slightly anti-clockwise relative to the line that connects the centre between the two loudspeakers with the centre of the listener's head (it can be shown that the sound field reproduced by the stereo dipole is almost exactly the same as the sound field reproduced by a monopole and a dipole positioned at the centre between the two closely spaced loudspeakers). It is seen that the widely spaced loudspeakers produce a very complex sound field whereas the two closely spaced loudspeakers produce only two wavefronts. The first wavefront is intended for the left ear, and the second wavefront, whose amplitude is slightly smaller than the first, is intended for the right ear. The resulting interaural time- and level differences are identical to those generated by a real sound source at the position of the virtual image.